It’s been a month since I was laid off from my job with the local public library. I was among nearly 40 employees who volunteered to leave with severance as part of a plan to keep all the system’s branches open, despite a 1% property tax cap and lower property values. There has been enough finger pointing to go around about the decisions made by this particular county nonprofit in my part of the world, but the hard truth is that public libraries, large and small, are in jeopardy all over the country. During the four years that I worked at several branches, my naive notions of the librarian as a keeper and finder of books steadily morphed into the complex role of many: social worker, lawyer, teacher, confidant, doctor, storyteller, babysitter, tax preparer, cop, and janitor, to name a few. While my coworkers and I were strictly forbidden to practice any of these jobs in a formal sense, we certainly needed to know how to deal with the lack of vital services not only to the general public, but to the libraries, as well. And yet, these same folks would stand before me when their home computer died and they had an important document to print out. Or they were visiting a relative without Internet and needed to change a reservation or boarding pass. Or they had to provide a power-of-attorney form and couldn’t navigate the online legal maze. Or their kids were required to find a “real” book on an obscure topic for a school assignment. Or maybe they had just lost their house, job, car, and/or health and found themselves looking for a safe place to keep warm. Well, you might wonder, is this the library’s job? Are there no community centers and homeless shelters? Doesn’t the city provide unemployment offices and social services? Yes. Does everyone know about these options? No. Are they accessible even on weekends? Often not. Is there public transportation available to where people need to go? Well, if you still live out in the suburbs, you’re out of luck. 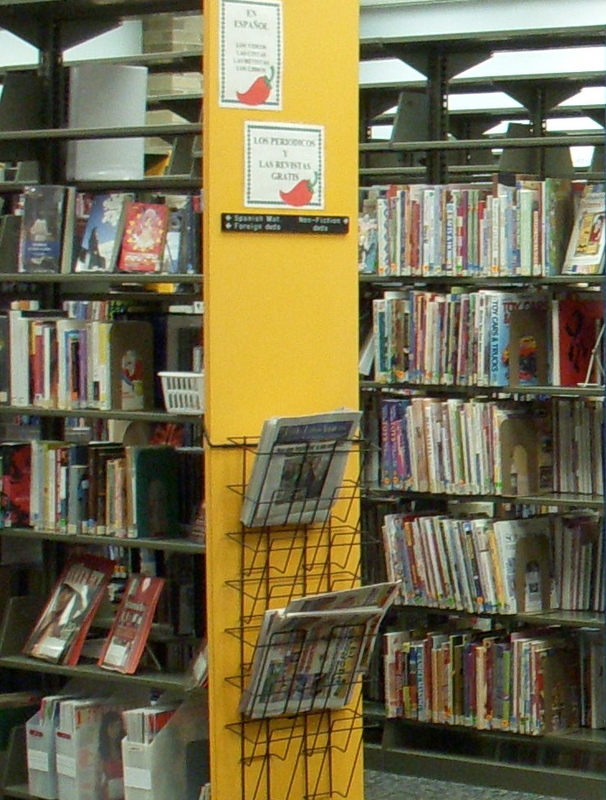 Chances are there will be a library closer to you than other public facilities. And the old-fashioned image of the pinched dowager, hair in a severe bun, wearing crepe-soled orthopedic shoes and reading spectacles perched upon her nose, holding a bony finger to thin lips, is a far cry from her modern counterparts who must shout over the din of the latest ringtones while their younger patrons have meltdowns in the call-a-story booth. Though I have to confess, the first time I found myself in shushing mode with a finger and eyebrow raised while giving some noisy offender the evil eye, I felt like I had truly arrived. For a brief time, I was a librarian. I sit down in front of my work computer at the library reference desk, and realize that the keys look different. There are no Enter, Delete or Control buttons. In fact, the whole top row of mysterious function keys is missing. There isn’t even an Escape option. I look up and there’s no screen. I look in back — not even an electric cord, for heaven’s sake. I frantically search my colleagues’ computers at the main desk and find that they’ve all been replaced. Remember them? I bet some of you will read this and know. You may not want to admit it (kinda like acknowledging that you inhaled the incense back in the day). But there was a time when we were clattering away on noisy little boxes and ripping those returns. Ah, yes, the smudge of tangled ribbon ink staining our hands and the smell of clotted liquid paper filling our nostrils. For those of you too young to have suffered the pain of mechanical typing, it was a necessary office practice where one pressed with great force on a button with a character emblazoned on it. This button was attached to a metal bar with the same symbol in raised form at the end, which would strike a tape covered with ink like a little hammer and leave a splotchy imprint on pristine sheets of paper carefully rolled around a cylinder. During the time I attended college (when large reptiles roamed the land) I lusted after my schoolmates’ electric Smith Coronas with the low-slung keyboards and the nifty tape cartridges you could eject and swap out on a whim. There was even a correction cartridge for rare mistakes. But still, you wouldn’t dare mess up on one of those beauties. And what did I use? Always concerned that I might lose my head and conform to the herd mentality, my parents sent me off to the halls of higher learning with my grandfather’s prehistoric Remington manual typewriter, a huge metal monstrosity that weighed as much as a good-sized pterodactyl. My father was assigned to carry it on move-in day, and typing with that beast was the best way to get my fingers strong enough for throwing clay on the wheel in pottery class. As an added benefit, who needs cross-training when you can lug a 500-pound example of moveable type up and down the stairs. Oh the noise! To make a capital letter, you had to lift the entire carriage up to shift, hit the key, and then let the whole buggy fall back down with a crash. Typing a bibliography was pure living hell, as confirmed by my next-door neighbor during junior year, while I banged away all night on my research papers. Through the paper-thin walls, my typing efforts evidently interfered with HIS all-night research on the steady stream of coeds he brought back to his room. Hey, I considered it payback for playing Van Halen through his guitar amps at 3 a.m. on a regular basis. There is no telling how many forests I decimated by rolling paper in crooked, or forgetting to mark the bottom margin in pencil. I’d be flying along in a typing frenzy and watch my last line slowly sag off the end of the world as the paper’s bottom edge popped out and the bail roller lost its grip. Footnotes were my nemesis. My room would be littered with little whiteout papers I’d slip in behind the ribbon to make corrections. I fell in love with the erasable typing paper until it smudged and was outlawed by professors. I confess that I still have nightmares about carbon copies. I wake up in a cold sweat. The typewriters still loom somewhere in the dark. Thank goodness I didn’t have to type up an entry for the card catalog on those tiny 3 X 5‘s in my dream. I work with folks who did, though, and I am in awe of them. As I wait for the future of my job and the fate of public libraries in general to be decided, I marvel at how spoiled we’ve become with technology and how much information we owe to the sweat and toil of librarians past. After all, back when the dinosaurs roamed, and the chatter of typewriters filled the air, we had to fix our mistakes the hard way.